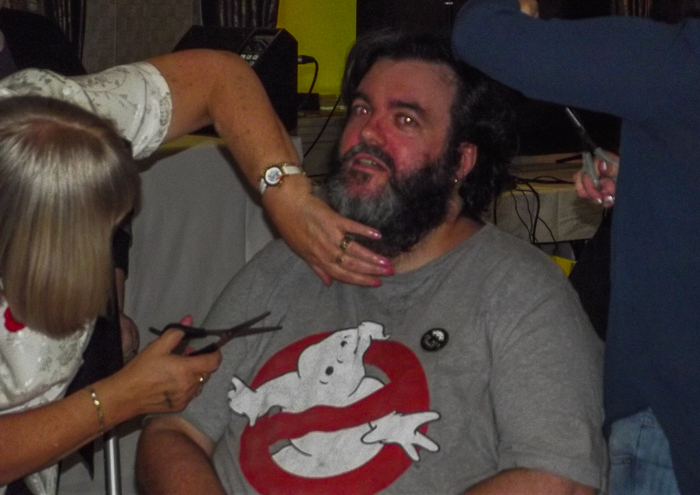 A Weekend at #FantastiCon 2015. And what a weekend it was! I first mentioned it in an earlier post, find it here. 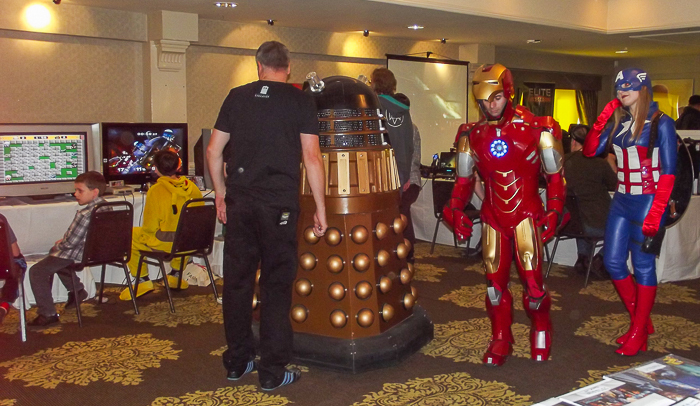 This was the second fantasy/science fiction convention I’ve attended. 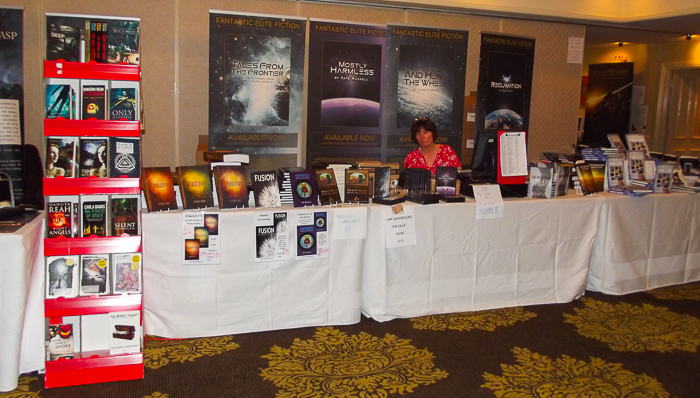 Both events were organised by my amazing publisher, Dan Grubb of Fantastic Books Publishing. The first was in Hull, last year. This year’s event took place in the Country Park Inn on the banks of the river, located under the famous Humber Bridge at Hessle. 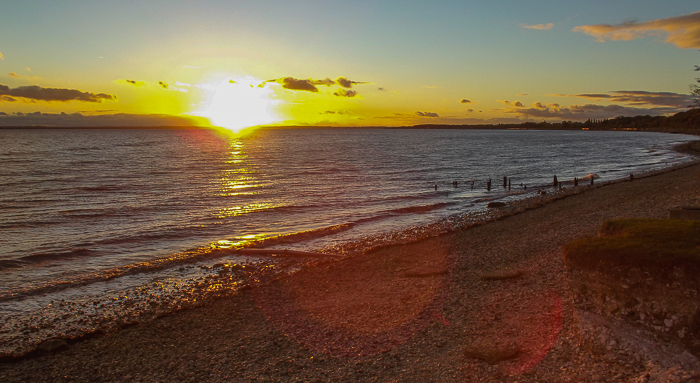 I spent many hours of my youth on the riverbank, as I then lived in Hessle. For this FantastiCon, I was unable to book accommodation as early as I wished since we were in the process of moving house at the time. As a result, I stayed at a pub about ten minutes up the road by car. It was pleasant enough, but the drive made it difficult to be as fully involved as I would have liked. 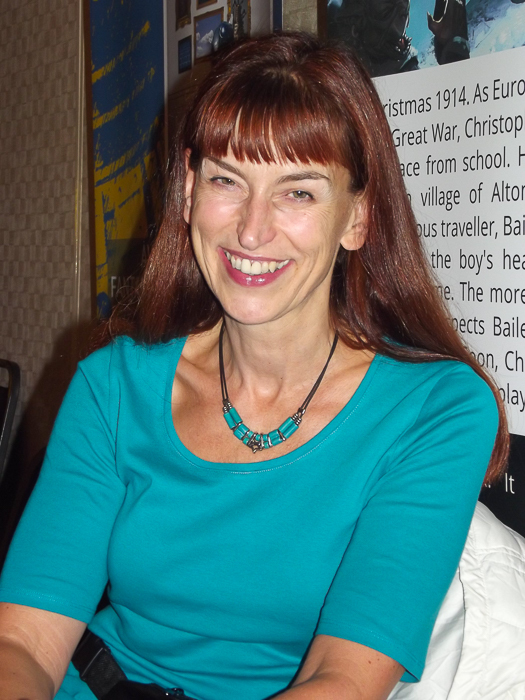 This post is about the experience and benefits of attending such an event as an author. FantastiCon, as its name implies, is about fantasy. But it’s also about science fiction and gaming. The event attracts people from many different walks of life who share a passion for things outside the ordinary. Penny Grubb manages the book stall before the crowds descend. 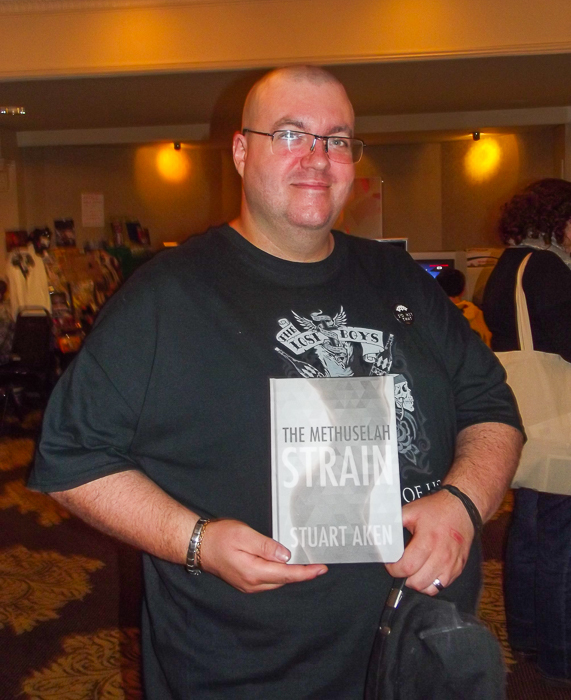 I was there essentially to launch the hardback edition of my science fiction novella, The Methuselah Strain, one of a series of such hardbacks launched at the convention. I also took part in an author panel where members of the audience asked a group of six writers questions about their work. My fantasy trilogy, A Seared Sky was also available in print form for me to sign for readers. So, those were the ‘duties’ that took me 200 miles from my new home to the river I frequented in my youth. But, in reality, I attended this venue to meet with people I’d met the previous year. What most impresses me about the people who make these events so enjoyable is their warmth, generosity and ready acceptance of strangers into their midst. They all have an interest in the words and/or images that contribute to the world of fantasy in its various forms. They are all passionate about this part of their lives. Some come to mingle and swap experiences with others of a like mind. Some attend to take part in actual or virtual games based on worlds invented by others. Some come to meet celebrities from film and TV. Others come to display their amazing creativity in appearing as their fantasy heroes. And some come to buy books and meet the authors of the works they’ve enjoyed. I met up with readers from last year who then bought the other two books in the fantasy trilogy, now available as paperback editions. Many expressed their enjoyment of the first book, Joinings, and spoke about how they were looking forward to reading Partings and Convergence. Others were new to my work but risked their hard-earned money on my books. And many bought the hardback version of The Methuselah Strain, which I signed for them. Interaction with these readers was all positive. It’s great to meet, in the flesh, those who’ve read and enjoyed your work as an author. It’s even better to find there are people willing to spend their hard-earned cash on the books you’ve produced. It’s a humbling experience and one that no amount of online networking can match. I was also able to spend time talking with the interesting Dr Who actor, Simon Fisher-Becker, whose anecdotes about his life as an actor have now been collected into a book, My Dalek Has a Puncture. I also spent some time with Barrie Holland who was an actor on Star Wars. I reconnected with Kate Russell who presents a TV show, BBC Click, and also writes. She’s a lovely woman who gets on with everyone and manages to lead an extremely busy and productive life as presenter, technical guru and writer. Penny McDonald, the actor who’s been the major voice artist for the audio versions of many Fantastic Books Publishing books, was a mine of information and a real breath of fresh air. With no airs or graces, she demonstrated her ability to become the characters of the books she turns into audiobooks. Her range of such voices is extensive. And she’s a thoroughly charming and entertaining woman. I enjoyed talking with her and listening to that voice that is so capable of creating a multitude of characters. Other authors also attended. Readings were given by John Scotcher, Kate Russell, Simon Coates, Nat Robinson, Michael Brookes and Drew Wagar. And the writers panel included Chris Dows, Drew Wagar, Simon Coates, Nat Robinson, John Scotcher and myself. We took some intelligent questions from the floor and enjoyed the experience of interacting with our readers. 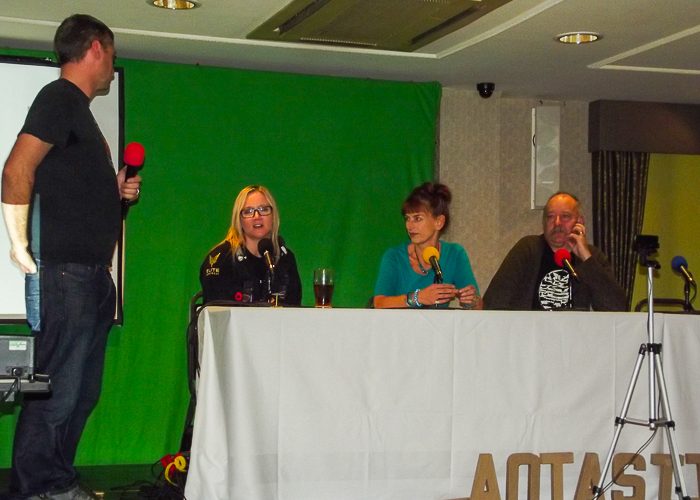 Dan Grubb introduces the Audio Panel of Kate Russell, Penny McDonald and Toby Longworth. The gaming aspect remains something of a mystery to me. I would quickly become addicted to such activity if I were to give it a try, so, for the sake of my writing, I avoid that activity. But there were many players there and much equipment and associated activity that kept them well occupied. 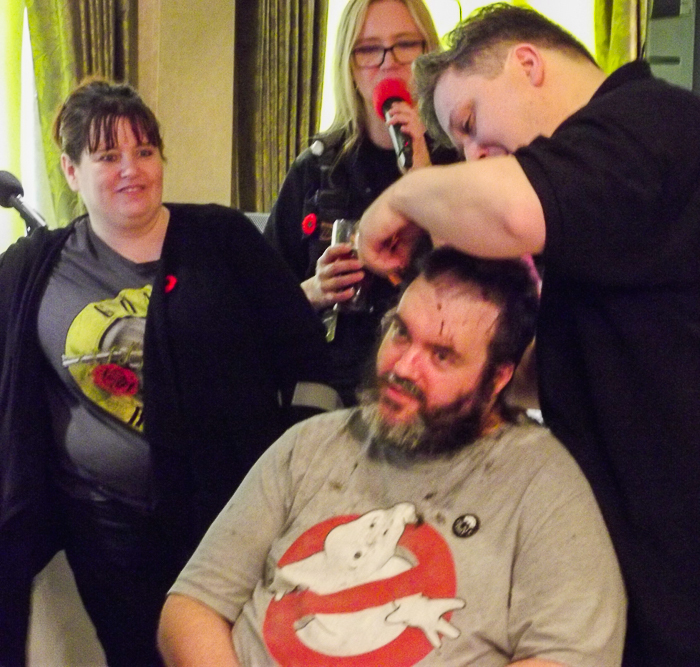 And one of this group, Dave Hughes, volunteered to have his hair and beard clipped in public in aid of the Marie Curie Foundation, for which he has so far raised over £2,000. His JustGiving page was closed on Monday, but I’m sure he’d be very happy to accept further donations. You can find him under his internet alias of Selezen on Facebook, here, on Twitter, here, and at his website, here, where there’s a link for the charity. The shaved Dave Hughes pops by for a copy of my book. 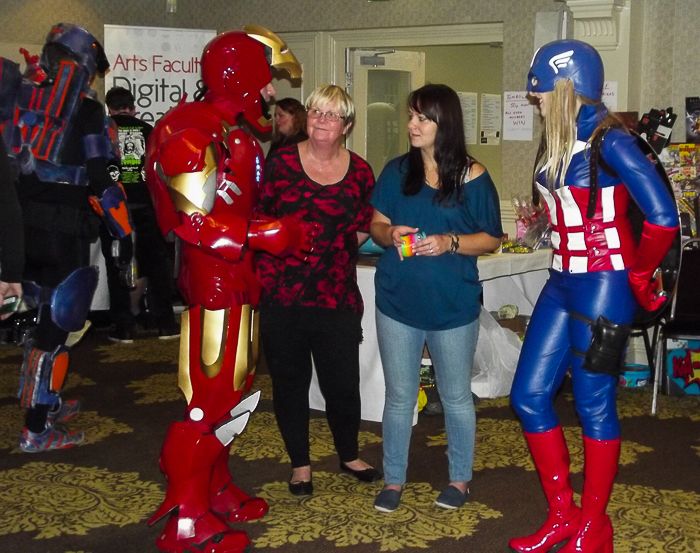 The group of Cosplayers, dressed in outfits of amazing detail and design, entertained us with their portrayals of various super heroes and fictional characters. Some had bought outfits and worn them as they came. Others had augmented shop-bought costumes to enhance their characters. The most imaginative had made their costumes, and these were amazing outfits, full of detail and associated accessories. You have to admire the dedication that drives these folk to make such costumes and wear them all day. The sun goes down on the river at the end of the first day. At the end of each day, around eight in the evening, those hardy and agile enough took part in something called NERF wars. I confess I allowed my age and diminished sprightliness to excuse me from this fun activity. But those who partook seemed to enjoy it tremendously. On the Sunday, Dan Grubb accompanied by his lovely wife, Gabi, gave out the prizes from the charity raffle as Steph Wyeth gave an amusing and entirely spontaneous commentary to amuse the audience and tease the recipients. I did quite well out it. There was also the award ceremony, with hand made awards presented for various achievements and thanks expressed to the generous volunteers who had made the whole event run smoothly. All in all, a thoroughly enjoyable weekend. If you’re a writer and you get the chance to attend a convention related to your writing, I’d urge you to do so. It’s a very worthwhile experience. And, if you’re a reader and a convention covering your area of interest comes along, do make a visit. You’ll meet like-minded people, talk with authors and generally enjoy a period of fascinating interaction that can only enhance your enjoyment of future books. What a fabulously colorful way to mingle with muses and fellow creatives! And they’re all such generous and cheerful folk! Glad it all went well, Stuart. Sounds as though it was a good weekend. At the risk of offering a pun, Mick, it was Fantastic!